A vets which appealed for tiny knitted jumpers for its small patients says it has been inundated with offers. Golden Valley Vets, in Somerset, uses the "mini-pig jumpers" - or "piggy pullovers" - to keep guinea pigs and rabbits warm after general anaesthetic. But following an appeal for knitters on Facebook, the vet says it now has plenty of knits. 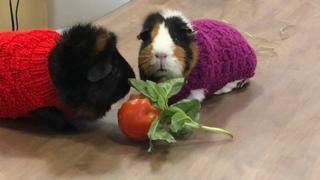 Katie Church, of the Nailsea practice, said the miniature sweaters not only "look very cute" but "definitely help". The tiny hand-knitted jumpers were originally knitted and donated to the practice by one of the nurse's mothers. But after a picture of Gingernut the guinea pig wearing a green sweater was posted on the practice's Facebook page, along with an appeal for "guinea pig jumpers" the practice now says it has enough. "The drugs that we give mean they can't regulate their body temperature quite so well, and with our small furries you get more dramatic heat loss," said Ms Church. "So we do what we can to try to keep them nice and warm and the cute little jumpers are one of the ways that we can do that."